It’s really hard to find truly spicy convenience food these days. The trend is picking up, but it never really matches what you can make at home or buy in a restaurant. Despite this, convenience food loves to continue branding itself as being continuous multiples of “dangerously spicy”, while the actual heat level never really rises above “uncomfortable”. 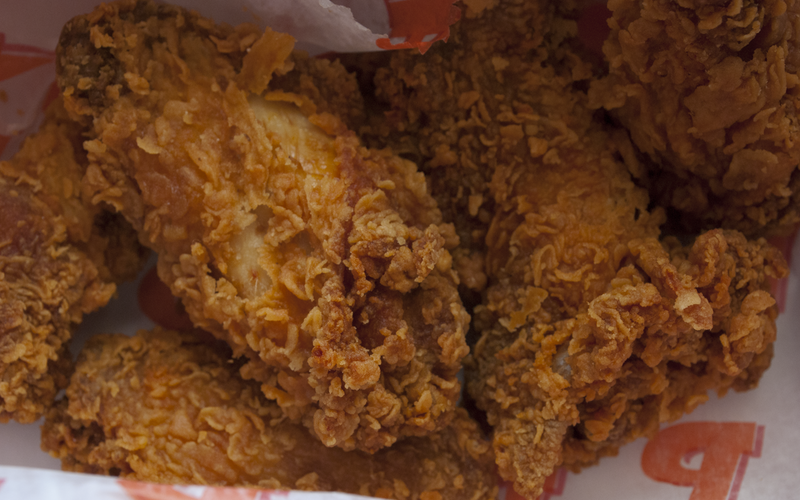 Enter the Popeyes Ghost Pepper Wings. 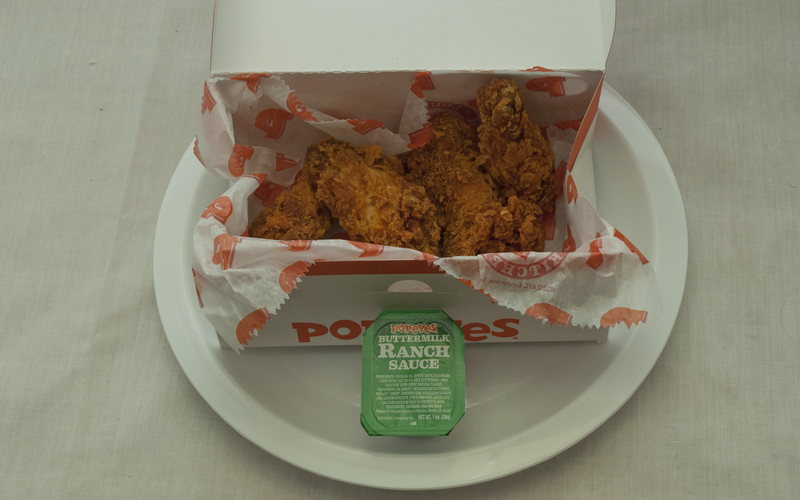 For $3.99, you can get six wings marinated in a blend of peppers, a buttermilk biscuit, and ranch dipping sauce. This sounds pretty good, but just how spicy is it? 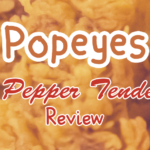 In this article, we’ll not only be discussing Popeyes’ newest promotional item, but also the history behind the much-feared ghost pepper. The Bhut Jolokia (referred to in English as the “ghost pepper”) is a powerful pepper, and it’s currently the third hottest pepper in the world. It has a long and complicated history of getting the fame it has right now, but to start things off, let’s discuss how hot it is. SHUs (Scoville heat units) are the units of measurement used in the Scoville scale, the primary measure of pungency in chili peppers. As a frame of reference, most hot sauces (Frank’s RedHot, Tabasco, and Sriracha) average around 2,000-3,000 SHUs. A jalapeño is 2,500, while cayenne peppers are 30,000. Seemingly in the upper range of reasonable human consumption, a habanero is 100,000. Meanwhile, the Bhut Jolokia is 1,041,427 SHUs. Yikes! Sweating is one thing, but projectile milk vomit is another. So how did it get so popular? In 2000, India’s Defence Research Laboratory submitted a study to Current Science, an Indian scientific journal, reporting the Bhut Jolokia (at the time known as the Tezpur chili) as having 855,000 SHUs (the highest at the time). At the time, this had no culinary implications: it was purely for the purpose of finding the most efficient pepper to be used for riot control. In response to this news, the Chile Pepper Institute of New Mexico State University obtained Bhut Jolokia seeds in 2001 for the purpose of seeing if the pepper really was as strong as claimed. However, research was slow, as it took years to grow enough peppers for the study. It wasn’t until Fall 2006 that they had enough to submit to Guinness, but the time taken finally paid off. The 2007 edition of the Guinness World Records ranked the Bhut Jolokia the world’s hottest chili pepper with 1,041,427 SHUs, defeating the previous Red Savina habanero (248,556 SHUs). This gave the pepper a massive surge in popularity, pushing it into the public eye and boosting its overseas imports. The Bhut Jolokia reached local restaurants in 2008, where it quickly became a novelty and the focus of many food challenges. Floridan cafe Munchies 420 was one of the first to capitalize on it with their Fire In Your Hole wings, a hot wing challenge that involved eating 10 wings covered in an extremely spicy sauce that included extract of Bhut Jolokia. In 2009, the Texan burger joint Chunky’s Burgers managed to put the Bhut Jolokia into the public eye when their Four Horsemen Burger appeared in an episode of Man v. Food. The burger’s namesake is the four peppers that star in it: jalapeño, serrano, habanero, and – of course – the soon-to-be-notorious Bhut Jolokia. It was on February 13, 2012 that the Chile Pepper Institute discovered a pepper hotter than the Bhut Jolokia: the Trinidad moruga scorpion. It’s 1,200,000 SHUs on average, but individual plants can reach 2,000,000 SHUs. From there, things got even hotter in November 2013 when the Carolina Reaper (a cultivar of chili pepper, specifically bred to be as spicy as possible) was declared by Guinness World Record to be the hottest pepper, with a peak of 2,200,000 SHUs. The Bhut Jolokia is now the third hottest pepper, but the only one that has managed to make substantial appearances in the casual food industry. Red Robin was the first chain restaurant to utilize the Bhut Jolokia, and it came in the form of two burgers released on June 26, 2012: the Fiery Ghost with fresh jalapeño slices and pepper jack cheese, and the Cry Baby with both crispy and sautéed onions. 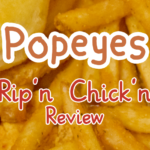 They both used a ketchup sauce blended with Bhut Jolokia, which would have had the potential to be very hot indeed, but general reception was that it wasn’t notably spicy and barely stood up to local restaurant attempts. The Fiery Ghost was generally regarded as the more spicy one… not for the aggressively-branded ghost pepper sauce, but instead for the jalapeño slices on top. Jack in the Box was the next to take a swing, releasing Jack’s Blazin’ Chicken Sandwich on April 10, 2014. Featuring a spicy chicken fillet topped with Ghost Pepper Ranch sauce, grilled onions, jalapeño slices, “swiss-style” cheese, and the obligatory lettuce and tomatoes, it had a lot of theoretical potential. But the reception was the same: it just wasn’t very spicy. 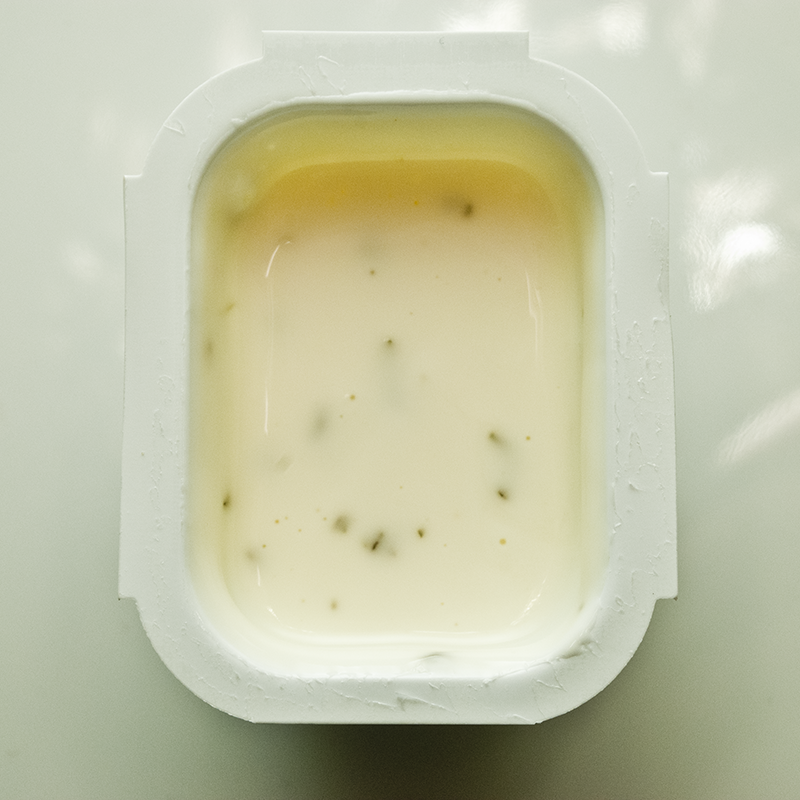 The maneuver of blending the Bhut Jolokia with ranch dressing wasn’t very well received, since dairy products are one of the most efficient ways to cool off your mouth after eating something spicy. The result was a complete neutralization, and the reception was just the same. As if all of that wasn’t harsh enough, Midwestern fast-food chain Taco John’s released their own take on Ghost Pepper Wings in Fall 2014, which received very little fanfare and lukewarm reception. There’s a lot that goes into why the Bhut Jolokia hasn’t reached its full potential in the casual dining world. While the Bhut Jolokia is indeed an incredibly hot pepper, it’s not cost efficient to use it in enough quantities to provide its famed heat. The only way to get the full 1 million SHUs out of the pepper is to eat it raw, and only when it’s been grown in its intended climate (other climates produce plants with inferior pungency). The industry is keen to use the popularity of the plant to their advantage, but all it really amounts to is that they get to use less plant to produce the same amount of heat you would have already gotten out of the same dish made with other peppers. It’s difficult to say why these restaurants are afraid to use the pepper’s full power, but legal issues regarding dangerously spicy food in the past may be a factor. The strength of chili peppers is one that’s both revered and feared, but for fast food moguls, they err towards the side of fear. Even if the danger level isn’t actually that high, it’s easy (if irritating) to see why a member of corporate would be afraid of somebody eating dozens of their spicy sandwiches and going to the hospital for it. This box is haunted. Haunted with the ghost of flavor. We ordered the specialty 12-piece because we were particularly hungry, but we soon wondered if this was the right choice to make. 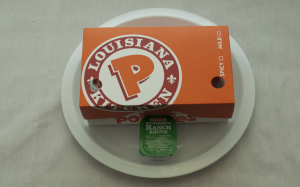 The default 6-piece order ($3.99) comes with a biscuit, and the 12-piece order ($7.99) ended up being two 6-piece boxes with no biscuits, which meant that it might have been more efficient to just order the default promotional item twice. We were at first excited about the value because it seemed like 6 wings for $3.99 was quite a bit of food, but upon inspecting the size of the “wingettes”, we realized this couldn’t be further from the truth. With the price clocking in at $1.50 per wing, this special was far less “special” than it seemed. The icy chill of this chicken proves that a ghost is inside it! Once we had finally settled down to eat, the first thing we noticed was that the chicken was already cold. We’re used to our food cooling down between us purchasing it and arriving at our photography station, but this was already cooling off the moment that it was placed in our hands. 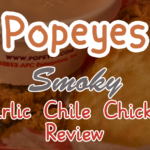 This isn’t really a point against Popeyes as much as it is the individual place we went to, but it did affect our feelings about the chicken. Whoa! Okay, that is pretty spicy, but it takes a while to get to you. The spice is impressive for a few seconds, and then immediately leaves. The afterburn lingers for considerably longer than the taste, leaving you with an unpleasant fiery sensation in your throat, but not much flavor to speak of. This is an annoying trend of most spicy convenience food, which opts out actual flavor for just providing throat-burning painful heat. The only thing that we had after a few hours to remember this chicken by was oozing sinuses and sweaty faces. Why is it called Buttermilk Ranch when ranch dressing is supposed to contain buttermilk anyway?! The Buttermilk Ranch sauce was theoretically a good complement to the heat, and it should have provided soothing dairy coolness to the chicken’s pungency, emphasizing both qualities. In practice, however, it mostly neutralized the flavors, and the ranch soon became more pleasant to eat than the chicken. Warden kind of felt like Blackened Ranch would have been a better pair for this, while Paula felt that the cool ranch was exactly what the chicken needed, but agreed that more flavor on the chicken would have been better. On top of those minor gripes was also the fact that it was next to impossible to dip the chicken into the sauce. The only real way to fit the chicken in is cartilage-side down, meaning that none of the meat gets covered, and you’re left with way too much sauce left over when it inevitably clings to the inedible crevices. Ugh. This would have been fantastic in concept, but in practice it’s an overpriced attempt to capitalize on a fad without actually making any attempt to go outside of the world’s fast food comfort zone. 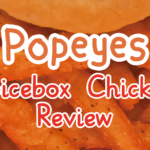 The Spicebox Chicken from last month was vastly superior in both spice and heat, and the questionable value of this deal just made it not really worth the pain of never being able to touch your eyes again.